Avingard entered Dragonsreach and made his way up to Proventus. “Excellent. You’ve done us a great service. Here is your reward,” came the reply as Proventus handed Avingard one hundred gold. Avingard thanked Proventus and then left Dragonsreach and returned to the market. Realizing that he was carrying a lot of items from his two tasks, Avingard decided to sell as much as he could so he wouldn’t’ have to carry it all to Solitude. Looking around Avingard noticed a general goods store called Belethor’s General Goods. He entered the store. Belethor at work in his shop. “What have you got for sale?” Avingard asked. Belethor described a list of items he had to Avingard, but none seemed interesting to him. 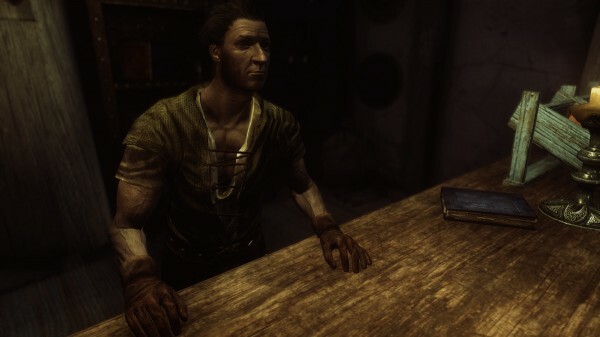 Avingard sold many of the unneeded items to Belethor, who was happy to buy them to stock his store. “Thanks for the business,” Belethor said to Avingard. “No problem,” Avingard replied as he left the store. By this time it was evening and the temperature in the air began to drop as the sun began to drop below the horizon. 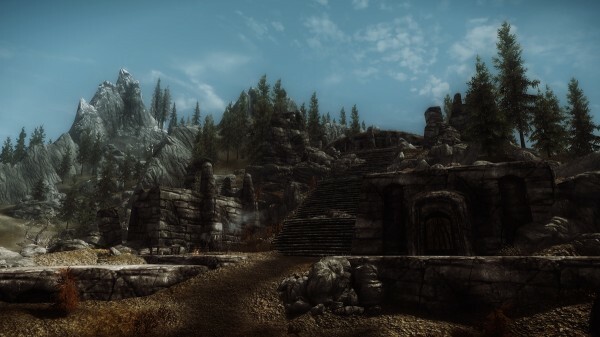 Avingard made his way across the market and entered the Bannered Mare. The large fire that roared in the middle of the room had heated the inn nicely, and Avingard quickly warmed up. He made his way over to the bar, where Hulda smiled as he sat on a stool. “How did the second task go?” she asked curiously. Avingard ordered a strong drink and some food, which he quickly consumed. He turned toward the fire and enjoyed the music Mikael was playing and watched many of the patrons enjoying themselves after a day of work. After some time of relaxing at the bar, Avingard placed ten gold on the bar and walked up to the second level of the inn and entered his room. He placed his sword next to his bead, and then sat on the bed and slowly removed his armor. His body was aching in many places from the battles he fought that day, but he learned some valuable lessons in all the battles. Avingard fell back on the bed, rested his head on the pillow and thought about the journey ahead of him. Within a few minutes Avingard fell fast asleep thinking about his journey to Solitude.